This removes almost all drama scenes from the original movie to present you a true crime movie. 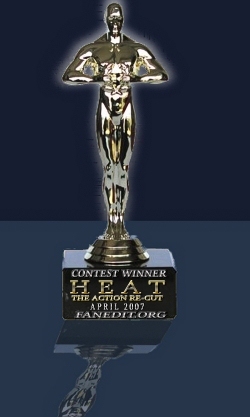 The audience can also choose their preferred ending. 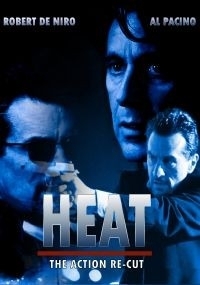 When I watched Yoshimi’s Action Edit of “HEAT”, I was intrigued, because what I remembered as a total bore (I know this movie has lots of fans, but not me, sorry), was suddenly thrilling, suspenseful, interesting. The overall quality of the edit was bad, the picture was very grainy and several cuts were not executed well AND I didn’t like the ending nor the most important scene of the movie, when Pacino and De Niro meet, because it feels hollow and empty to me. So I decided to once again go solo and create a fanedit project all by myself in redoing another already made fanedit. This time just in my way and I hope you will like it. Like Yoshimi I deleted all reference to Hanna’s (Pacino) family, to get rid of this drama which lasts longer than 30 minutes overall. Some of these scenes were great, but still they made no sense in my movie. If I leave out some reference, then the consequence is to keep on going that way. Always stick to the road you are on. If I could I would have deleted Diane Venora’s name from the credits, but that was not possible in a way I felt acceptable. But I was able to remove Natalie Portman. I also greatly reduced the part of Chris Shiherlis’ (Kilmer) wife (Ashley Judd), she has no affair, she is his loving wife, so she does not betray him in the end. Keeping the scene where she refuses to betray Chris was kind of difficult, because she is brought to the safe house by her affair, but with a few cuts I just turned him into a cop, or at least the audience is sure, he is one. Then there was this dragging scene, where De Niro and Pacino meet. But this scene was so empty. “I will not hesitate killing you, if I have to.” “I will not hesitate either.” blabla. This had to go, but with this the later on scene was a bit tricky, when Hanna talks about it. Finally I wanted a new ending, because I thought the original one was too long and way to unprofessional for McCauley’s (De Niro) strong, logical and thinking character. So I created my own ending, which feels to me very FRENCH CONNECTION like. I really like my new ending, it works very well with the images, the text and the music. Still I had second thoughts, if everybody will agree with me, so I tried something new: give the audience a chance to decide for themselves. So I edited the original ending again, fitting to my movie, but with the original outcome. And from the main menu the one with the remote in his hands can decide, which version he wants to watch. This was a lot of work, because this seamless branching thing is a little bit more complicated than I thought it would be.But in the end this is exactly the “HEAT” movie which I would love to watch again. - had to unfortunately keep Drucker say : “well, he is right, if you want out, that is out.” to cut that would have resulted in a bad looking cut. So it is better to assume someone said that before when we were not watching. - added glow effect to b&w still picture with text for Waingro’s death. I had avoided watching this edit for a while because I love Heat so much. Every time I watch it I’m enthralled. I don’t care about the runtime and I get sucked into the world. Why would I want to see an action movie that “contains about no drama” when I can just watch good ole Heat? I decided to give it a go and I was semi-surprised by the results. In no way is this fanedit superior to Heat (opinion) but the condensed version works pretty well. It’s kind of like watching a higher budget “LA Takedown” with a better script. But I found myself getting bored easily, I guess I just like drama. I watched the “lives” ending... I really hate title cards that tie up all the loose ends. I watched “dies” on it’s own and highly recommend that ending. The editing was fantastic, I couldn’t tell where anything was cut. It’s an older fanedit DVD so don’t expect HD quality. If you don’t want to watch a 3 hour crime epic and you prefer a taut 2 hour crime thriller check this one out.